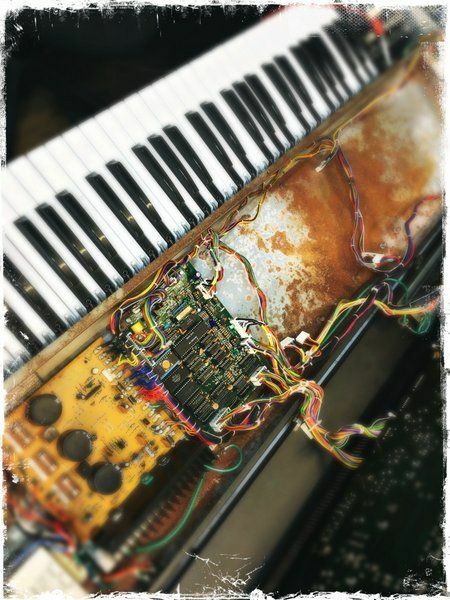 We very often get enquiries about fixing hum problems and 90% of the time there is no fault with the synth.You should remove it from your setup and ideally take it to another premises. Remove the mains earth in the plug(THIS IS FOR TESTING PURPOSES ONLY AND YOU MUST REPLACE THE EARTH FOR SAFETY REASONS AFTERWARDS) Plug in a pair of headphones or a battery powered amp. If the hum disappears the problem is in your setup. Usually (but not always) hum faults within the synth tend to be a low sine wave type sound whereas earth hum is a rougher more familiar sound. Most vintage analogue synths will be out of tune to varying degrees when first switched on from cold. Let the machine warm up for about 20 minutes and try again. Some synths can take up to an hour to be fully stable. This is usually but not always the battery. We can replace this and reload the factory sounds. If however the synth will not store and recall sounds even when turned on it's something else. Some later machines allow you to recover the factory presets from Rom with a startup key combination. How can I prevent problems with my gear? The best way to prevent many problems is to play the machine regularly ! Key triggering issues, noisy pots and other issues are all much more common with instruments that have been left standing. If your synth has NIcad or AA type batteries these should be removed before storing for long periods. Gigging vintage instruments is a risky business and although it will likely be fine we can't really recommend it. If your synth is 110v put a prominent label on the front stating that fact. Again 90% of problems are in the setup and not the machine. Read the manual very carefully.Check the Midi with a MIDI keyboard plugged directly into your instrument.Remove all other leads boxes etc. Make sure your synth is connected to the right MIDI channel and is not in omni mode. Check you have a MIDI lead wired correctly. With din sync make sure the sync switches are set correctly. Note that some MIDI leads will not work as din sync leads. All the pins must be connected. This of course is why Midi was invented. Different manufacturers used different systems which led to a lot of confusion. In general Moog ,Korg and Yamaha were the most problematic. Moog used an S trig system which means that if you connect to other machines you will get no sound as the machine will not be triggered. You can solve this problem using an S trig to Vtrig converter or viceversa. These are usually easily and cheaply available on Ebay and elsewhere. Some machines need a 15volt pulse to trigger and some machines only output a 5volt pulse The pulse will need to be amplfied to work. Things start to get ugly with cv scaling differences. Most synths use a 1volt per octave system but Korg and Yamaha use a Hz/ volt setup. These machine can therefore be quite difficult to interface. Regarding Cv to Midi we recommend the Kenton pro solo. It’s not the cheapest but it supports S trig and hz/volt systems. It also has adjustable scaling which can compensate for synths that are out of or have been incorrectly calibrated.